Follow U.S. Highway 14, the Laura Ingalls Wilder Historic Highway, west across the prairie to Walnut Grove, Minnesota, and then on to De Smet, South Dakota. Minnesota Prairie Roots file photo. MINNESOTA PRAIRIE ROOTS. My blog name honors my roots in Redwood County where Laura Ingalls Wilder, celebrated author of the Little House book series, lived for awhile as a child. Walnut Grove lies just 20 miles distant from my childhood home. It is a place where earth and sky spread wide, where fertile black soil grows tall corn and the wind seldom stops blowing. The American Writers Museum in Chicago. Photo courtesy of Lee Engquist. Some 500 miles to the south and east of Walnut Grove lies Chicago. Windy, yes. But otherwise distinctly different. Nothing prairie-like here in this city. Until you look close, to the new American Writers Museum which opened in the heart of Chicago in May. An overview of a section of the Laura Ingalls Wilder exhibit. Photo courtesy of Laurel Engquist. I’ve not visited the museum. Yet, I hold a connection to this acclaimed museum now showcasing a temporary exhibit, “Laura Ingalls Wilder: From Prairie to Page.” I grew up with the Little House books read by an elementary school teacher each day after lunch. That was long before the books grew in popularity, long before the TV series, long before Walnut Grove became a destination for Laura fans. My Laura Look-A-Like Contest photo close-up in the exhibit. Photo courtesy of Laurel Engquist. But my love of Laura’s writing and my native prairie roots are not my only connections to this exhibit which runs through spring 2018. A photo I took several years ago during a Laura Look-Alike Contest in Walnut Grove is included in the exhibit. Laura Look-A-Like contestants gather for a group shot in a Walnut Grove city park in July 2013. Minnesota Prairie Roots file photo 2013. Awhile ago, Boston-based Amaze Design contacted me about using the image. The design company manages content development for the museum. This section features noted American authors. Within the museum is info highlighting Minnesota writers F. Scott Fitzgerald, Sinclair Lewis, Charles Schulz and more. Photo courtesy of Laurel Engquist. An exhibit in the Children’s Literature Room. Photo courtesy of Laurel Engquist. Another exhibit focuses on the writing process. Photo courtesy of Laurel Engquist. From what my friend Laurel, who recently toured the 11,000 square foot literary museum tells me, the place is impressive. Located on the second floor of a building at 180 N. Michigan Avenue, it includes 13 permanent exhibits in six galleries plus temporary exhibits. Laurel spent hours there wandering, reading, observing and participating in interactive aspects of displays. She was surprised to find my Laura Look-Alike photo as part of the American Voices Exhibit. The prairie near Walnut Grove is especially beautiful in the summer. I took this photo at the Laura Ingalls Wilder dug-out site north of Walnut Grove many years ago. Minnesota Prairie Roots file photo. I’m honored to have my work included. I’m proud of my prairie roots, of my rural upbringing in a part of Minnesota made famous by a much-loved American writer. FYI: If you’re wondering how Amaze Design found my photo, look no further than searching the internet. I also have photos included in exhibits at the Children’s Museum in St. Paul and in the World War II Museum in New Orleans. All found my work online, on this blog. Disclaimer: Amaze Design paid for rights to use my Laura Look-A-Like image in the exhibit. Thanks to friends Laurel and Lee Engquist for permission to share their photos. A snippet of the display I’ve created for the Local Authors Fair at Buckham Memorial Library. TOMORROW EVENING (November 9) I join 13 Faribault area writers as we showcase the craft of writing at Buckham Memorial Library’s Local Author Fair. I’m ready with a display of sample published works, educational hand-outs, free candy and a Minnesota anthology for you to buy. I have limited copies of Fine Lines, The Talking Stick, Volume 26 in which five of my works published this year. Grab a mini candy bar from my table and get a bonus quote about the craft of writing. The drop-in event on the second floor Great Hall features each writer at his/her own table. So simply circulate, meet the authors and engage in conversation. You have only one hour, from 6 – 7 p.m., to meet everyone. This auction barn in Montgomery inspired my poem, “Sunday Afternoon at the Auction Barn.” Minnesota Prairie Roots file photo. where a farmer once greased wheel bearings on his Case tractor. in reverent respect of an ancient rural liturgy. sipping steaming black coffee from Styrofoam cups. Find me, introduce yourself and ask me about my passions—writing and/or photography—and hear my story. A promo posted at Buckham Memorial Library for the November 9 Local Authors Fair. TERM ME A WRITER, author, poet, blogger, storyteller, wordsmith, photographer, artist. All fit me and my passions—writing and photography. Buckham Memorial Library, Faribault. Minnesota Prairie Roots file photo. Next week I’ll share those passions at a Local Authors Fair from 6 – 7 p.m. Thursday, November 9, in the Great Hall of Buckham Memorial Library in Faribault. You’re invited to come and visit with me and 13 area writers. My poem initially published in In Retrospect, The Talking Stick, Volume 22, an anthology published by The Jackpine Writers’ Bloc based in northern Minnesota. This past spring Rochester Minnesota composer David Kassler transformed the poem into a song performed by a Chamber Choir at two concerts in Rochester. Minnesota Prairie Roots file photo 2017. This informal drop-in fair presents a wonderful opportunity to network and to show folks my work—I’m bringing lots of samples. I’m ready, too, to talk about the craft of writing. Writing truly is a craft honed through decades of experience. From pounding out hard news stories under deadline to penning poetry to blogging and more, I’ve covered most aspects of writing. As a wordsmith, I remain passionately passionate about my love of language and of storytelling. A serene country scene in Redwood County, Minnesota, where I grew up. Minnesota Prairie Roots file photo. In 2012, my poem, “Her Treasure,” was selected for inclusion in a poet-artist collaboration at Crossings at Carnegie in Zumbrota. Connie Ludwig, right, created a watercolor, “Pantry Jewels,” inspired by my poem. See the art behind me. This is an example of my rural-rooted poetry. Minnesota Prairie Roots file photo 2012. I write in a way that’s earthy and accessible. Rural. Homey. Comfortable. When you read my work, you understand me. I am genuine and unpretentious. Me shooting lake scenes while on a boat ride on a lake south of Park Rapids in mid-September. Photo courtesy of Jackie Hemmer at Who Will Make Me Laugh. In addition, you can purchase a recently-published anthology, Fine Lines, The Talking Stick, Volume 26, which includes five of my works: my award-winning short story, “Art Obsession,” another short story, two pieces of creative nonfiction and a poem. The collection features writing by 99 other Minnesota authors. I will have limited copies available for $10. And then just to sweeten the pot, I’m giving away chocolate. Grab a mini candy bar and let’s talk about the craft of writing and the art of photography. 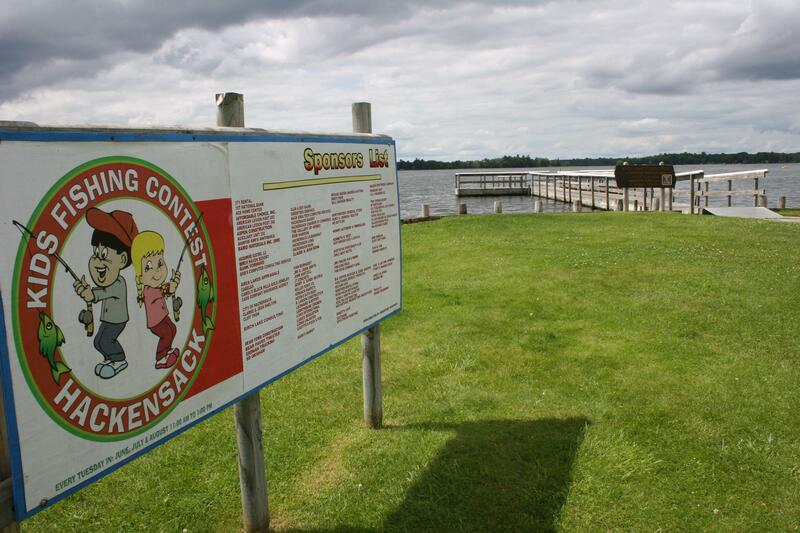 Every Tuesday during the summer months, Hackensack hosts a kids’ fishing contest on Birch Lake. Minnesota Prairie Roots file photo. IT’S A SWEET SMALL TOWN snugged in Minnesota’s northwoods north of Brainerd, half way to Bemidji. 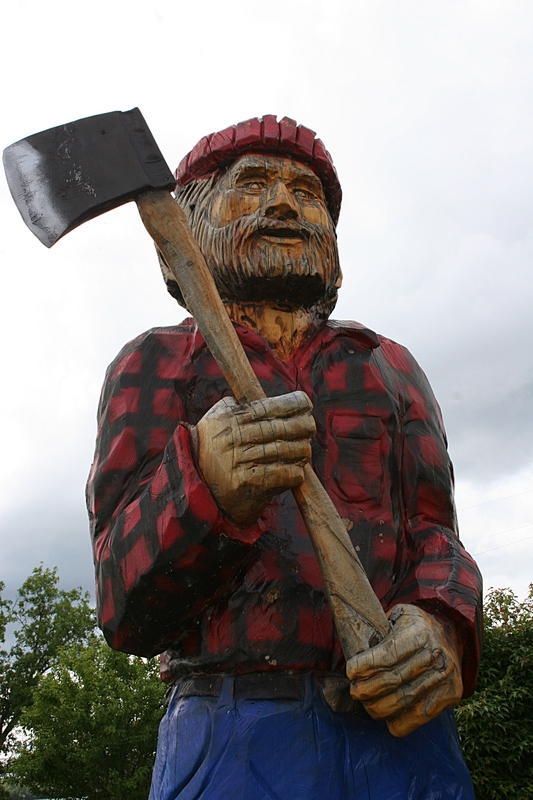 This would be lumberjack Paul Bunyan. Minnesota Prairie Roots file photo. 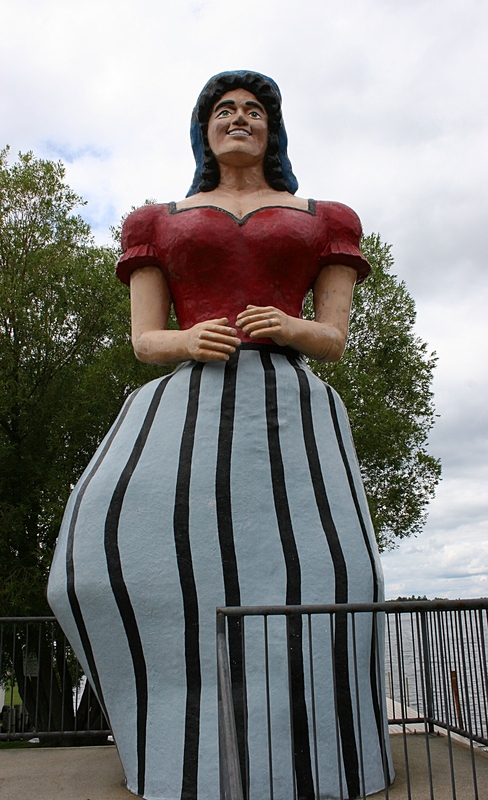 Paul Bunyan’s sweetheart, Lucette, stands next to the library along Birch Lake. Minnesota Prairie Roots file photo. and of his bride, Lucette. 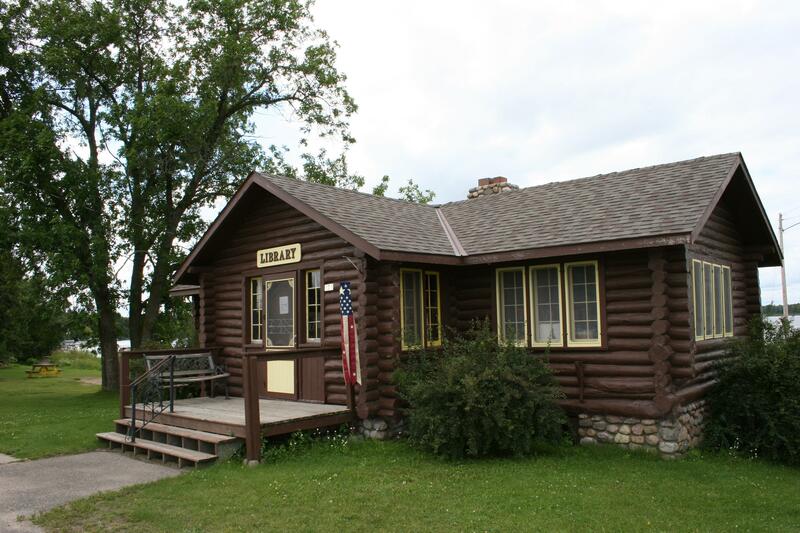 She stands near Birch Lake, next to an old log cabin that houses a library run by volunteers. The Hackensack library. Minnesota Prairie Roots file photo. It’s no wonder Hackensack, home to not quite 300 permanent and who knows how many seasonal residents, will host its 18th annual Northwoods Art & Book Festival from 9 a.m. – 3 p.m. this Saturday, August 17. I’ll be there. Sort of. I’ve submitted two poems to the Sixth Annual Poetry Display/Recognition, as I’ve done for several years. Fest-goers can peruse the poems inside the Union Congregational Church and vote for their favorites for the six Popular Choice awards. The poetry committee will also select six Works of Merit. Poets will read their poems beginning at 1:30 p.m. with award winners announced afterward. Local newspapers will publish the winning poems. A collection of works by eight Minnesota writers. But there’s more. Twenty-plus Minnesota authors and poets will sign and sell their books throughout the day. Sweet. Any event that promotes Minnesota writers and artists gets my support. 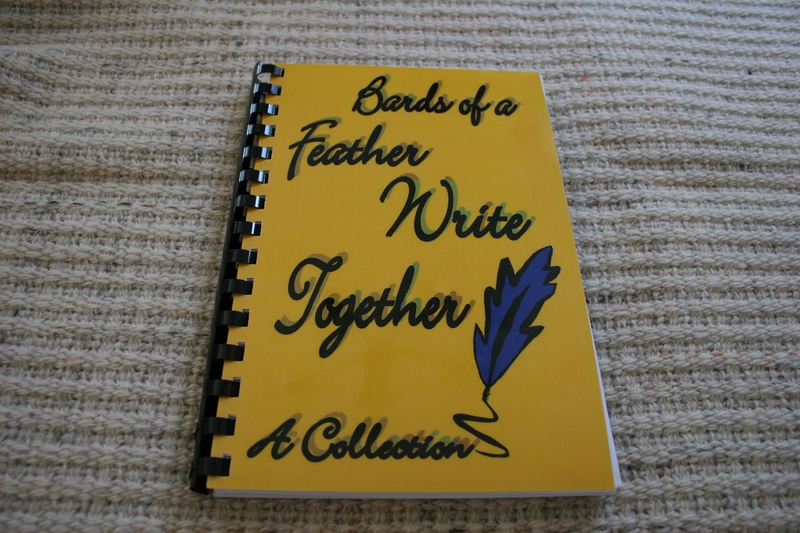 Among the literary offerings is Bards of a Feather Write Together—A Collection. It features the poetry, fiction and memoirs, some previously published, of eight Minnesota writers, all members of the writing group Bards of a Feather. I am currently reading this debut anthology and thoroughly enjoying the variety of voices and content therein. Visual artists will also be part of the Hackensack fest, selling their original artwork. Original and created by the artist. No resale items. Splendid. No Minnesota festival is complete without food, which you’ll find in the food court. I wish I could join this celebration of Minnesota writers and artists. But distance and previous commitments won’t allow me to be there. My poems will have to do. For this year. FYI: For more information, click here to reach the Northwoods Arts Council website. The council is the festival sponsor. DISCLAIMER: I received a complimentary copy of Bards of a Feather Write Together for review purposes. I THINK ALL WRITERS, if we’re honest with ourselves, face insecurities about writing. Can we write? Is our writing “good enough” to publish? Will anyone read, or even care about, what we write? I’ve long overcome any issues I faced about journalism style writing. I’m confident in my abilities to pull together a good feature story or another journalistic piece given my educational background in mass communications and my years of experience in journalism. And with several years of blogging to my credit, I’m also confident in that writing style. It’s poetry which has challenged my confidence. Although I’ve written poetry off and on since high school—which stretches back nearly four decades—I’ve never written much poetry, at least not enough to consider myself a true poet. Until now. Finally, this year, with the publication of two poems in two Minnesota literary journals and winning the spring Roadside Poetry contest, I’m comfortable adding “poet” to my writing credentials. Getting to the point of feeling comfortable with the term “poet” really began 11 years ago with publication of a poem in Poetic Strokes, A Regional Anthology of Poetry from Southeastern Minnesota, Volume 2. I considered that a stroke of good fortune. But when four more poems published in the next two volumes, I began to think that maybe, just maybe, I could write poetry. After all, I had competed against other writers to get into the Poetic Strokes anthologies. Then I had a poem accepted for publication in The Lutheran Digest. Next, I earned an honorable mention for my poem, “Hit-and-Run,” published last year in The Talking Stick, Forgotten Roads, Volume 19. Finally, this year, I had an official poet epiphany when I entered three poetry competitions and was subsequently published on Roadside Poetry billboards, in The Talking Stick, Black & White, Volume 20 and Lake Region Review. Although I don’t know how many poets I competed against in Roadside Poetry, I do have the numbers for the two literary journals. The Talking Stick this year published 140 pieces of poetry, creative nonfiction and fiction from 99 writers, me being one of them with my poem, “Abandoned Barn,” and my creative nonfiction, “Welcome Home.” That’s out of 326 submissions from 171 writers. It’s quite a process to get into The Talking Stick with five members of The Jackpine Writers’ Bloc reading all of the entries and then an editorial board meeting to vote and discuss. The top four to seven favorites in each category are then forwarded to celebrity judges—this year Kris Bigalk, Kevin Kling and Alison McGhee—to choose first and second place winners in each division. As for Lake Region Review, the process of selecting the works for publication is equally as rigorous. Co-editors Mark Vinz—author, professor emeritus of English at Minnesota State University Moorhead and first coordinator of MSUM’s Master of Fine Arts in Creative Writing—and Athena Kildegaard—author and lecturer at the University of Minnesota Morris—worked with a staff of 10. They read more than 200 submissions before narrowing the field to 27 established and emerging writers. I’m one of those 27. And so is Leif Enger, author of the 2001 New York Times best-seller Peace Like a River, which happens to be a favorite book of mine. It’s nice to be in the company of someone who, like me, writes with a strong sense of place. Most of my poetry connects to the southwestern Minnesota prairie, where I grew up on a dairy and crop farm. Specifically, the barn on the home place inspired my two distinct barn poems which published in The Talking Stick and Lake Region Review. Apparently I had something new to say about the old barn. 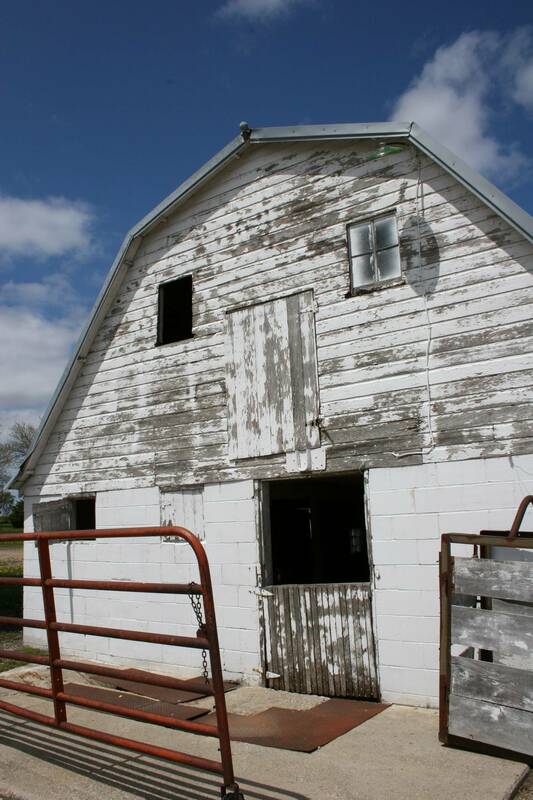 The early 1950s barn on the Redwood County dairy farm where I grew up today stands empty of animals. 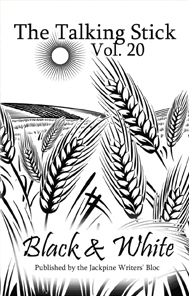 WRITERS FEATURED in the recently-published 212-page The Talking Stick, Black & White, Volume 20, are from, or have a strong connection to, Minnesota. Those published in the 138-page debut of Lake Region Review live primarily in west central Minnesota. Eight writers have been published in both collections. 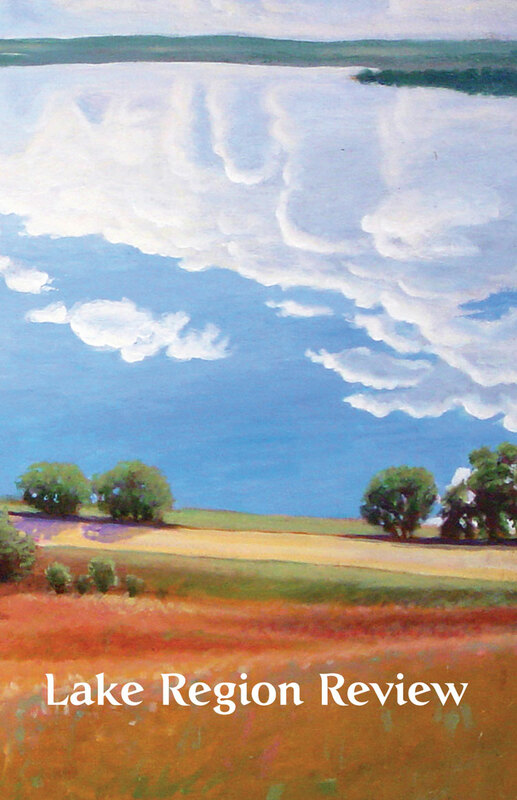 The cover of Lake Region Review is a detail of an original landscape painting, “Christina Lake: View from Seven Sisters,” by American impressionist painter Stephen Henning of Otter Tail County. IF YOU’RE A WRITER, specifically of poetry, did you/do you struggle with confidence issues? At what point did you/will you call yourself a poet? And click here for more information about Roadside Poetry. TYPICALLY WHEN I write poetry, I turn to my past, to childhood memories. Occasionally I deviate from that trip down memory lane. “Lord, My Rock” published in the fall 2004 issue of The Lutheran Digest and “Tribute to a Korean War Veteran” published in the May/June 2009 issue of Minnesota Moments magazine. My latest in-print-poem also detours from my typical subject of childhood days, although it stays on the road of memories, albeit this one a heart-wrenching, emotional recent memory. “Hit-and-Run” has just published in The Talking Stick, Forgotten Roads, Volume Nineteen, debuting this Saturday at a Book Release Party in the Northwoods Bank Community Room in Park Rapids. The poem looks back to May 12, 2006, the day my then 12-year-old son was struck by a hit-and-run driver while crossing the street just a short distance from our home. Thankfully, my boy was not seriously injured. But the driver was never found and the memories of that horrible incident still linger. Now I’m sharing, in poetic verse, how that morning unfolded emotionally for me. Certainly, I have not forgotten this road. Apparently my words resonated with the editors who reviewed the 200-plus poems submitted in this literary competition. “Hit-and-Run” was among the top seven poems selected by the editorial board for prize consideration by noted Minnesota poet Heid Erdrich. My poem earned an honorable mention. “A terrifying imagery/memory,” Erdrich partially wrote in her evaluation. If you would like to read my poem, the other winning poems and the fiction and creative non-fiction published in this latest collection by writers with a connection to Minnesota, check out the online purchasing options at The Jackpine Writers’ Bloc. The Park Rapids/Menahga-based group annually publishes The Talking Stick, which is sold by the Writers’ Bloc and several northern Minnesota bookstores. I’ve read two of the past anthologies and I promise that you will enjoy some top-notch writing by emerging and established Minnesota writers. The Talking Stick has an excellent, long-standing reputation and I’m proud to be published in it. If you’re a writer, consider entering the 2011 The Talking Stick competition. Submissions call for the 20th volume goes out in December with a March 1, 2011, submission deadline. Finally, if you’re in the Park Rapids area this weekend, consider attending the book release party, which begins at 1 p.m. 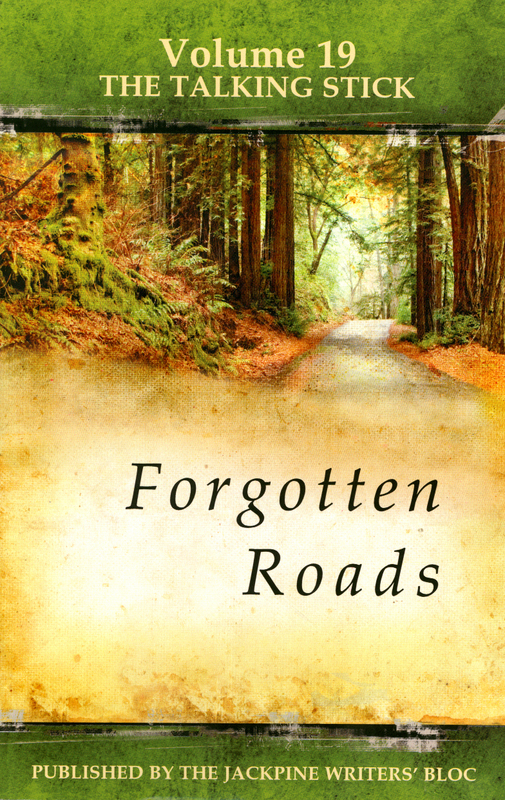 Writers published in The Talking Stick, Forgotten Roads, will read their works beginning at 2 p.m. No, I won’t be there as I have another commitment. But you’ll meet plenty of other Minnesota writers anxious to sell their books or compare notes on this journey we call writing.